Valcourt, Quebec, Canada, Sept. 18, 2015 – BRP enters the utility-recreation segment of the off-road market with the all-new Defender family of side-by-side vehicles. The Defender side-by-side vehicle brings tough features, capable performance with control and clever adaptability to consumers looking to reach remote locations to work, farm or hunt. The Defender family features two, new rear-mounted, Rotax V-twin heavy-duty utility engine options – a HD10 delivering up to 20% more torque at 4,000 RPM than the top selling competitor, and a high-torque HD8, an all new PRO-TORQ Transmission, high-precision chassis with TTA-HD rear suspension and automotive technology. The Defender family is engineered for hard work, but offers exceptional performance with control to provide the driver with the confidence to go practically anywhere. The vehicle’s 4-mode traction system, three selectable driving modes (Eco / Normal / Work) optimized tight turning radius (2-foot shorter than its top-selling competitor on a full circle) and specific Dynamic Power Steering enhances both its performance and handling for recreational use and tough jobs. An ample ground clearance, a plush suspension and class-leading towing and loading capabilities simplifies hunting, farming and ranching tasks. To afford owners more time for work and less for service, the Defender family offers also an easy and cost-effective maintenance. The Defender side-by-side vehicles supply clever and adaptable solutions to work smarter and enhance the ease of use. From the industry’s most versatile and functional cargo box to its class-exclusive modular dash adaptable system to its VERSA-PRO bench seat, the Defender vehicles supply industry-leading storage, a roomy, intuitive cockpit for various types of users. Customization is necessary in this segment and the Defender lets users make it their own with multiple LinQ quick-attach system points to welcome a wide choice of accessories, plus various cabin options and factory-installed features for its profiled cage. 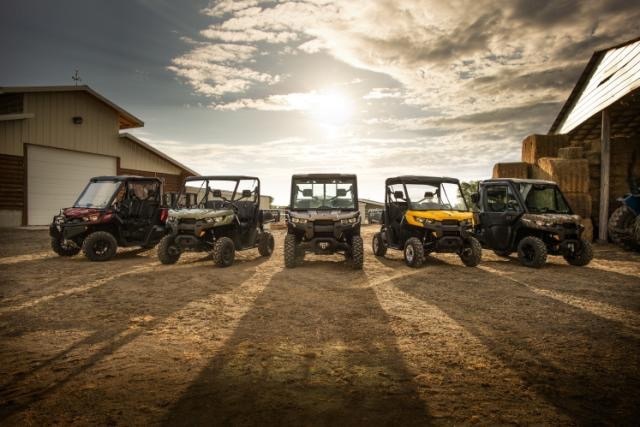 Furthermore, BRP adds to its industry-leading family of specialty X mr mud vehicles with the all-new, ultra-aggressive, 89-hp Can-Am Renegade X mr 1000R model. The mud-ready 4×4 ATV is purpose-built for mud with class-leading performance, key components and an intimidating appearance. A new Commander MAX DPS 800R, with its proven recreational-utility design, is the most affordable four-seat side-by-side in the Can-Am family. For more information, visit the Can-Am Off-Road website.